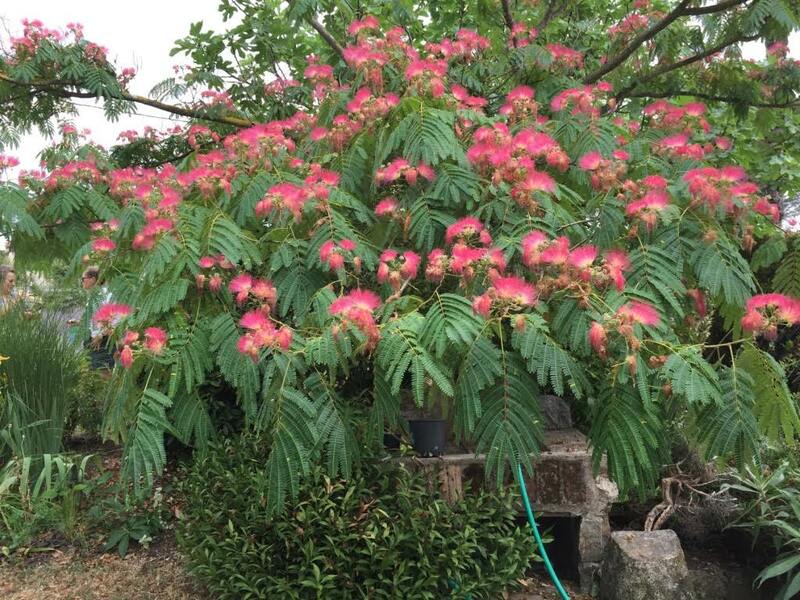 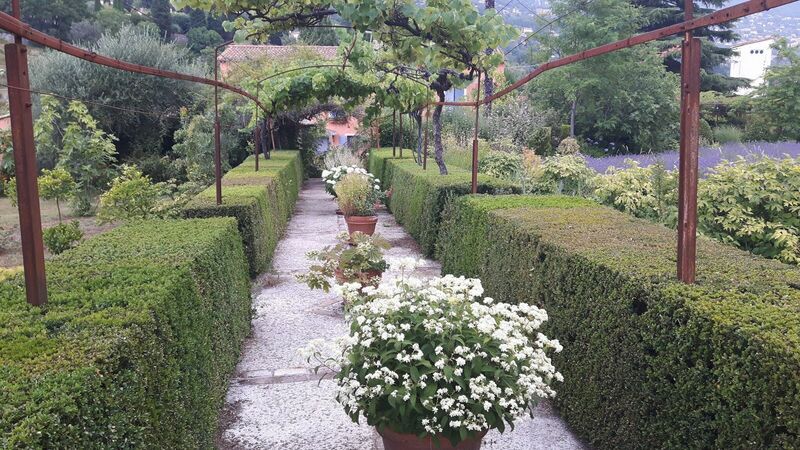 A thank you to Mavis McQuade for suggesting we should visit this garden. With five cancellations the day before the visit we were just nine members in three cars and equipped with trusty GPS we all arrived at the venue in good time and were delighted to have Gabrielle Wellesley with us again (on a mission to return her 2CV car to the UK). 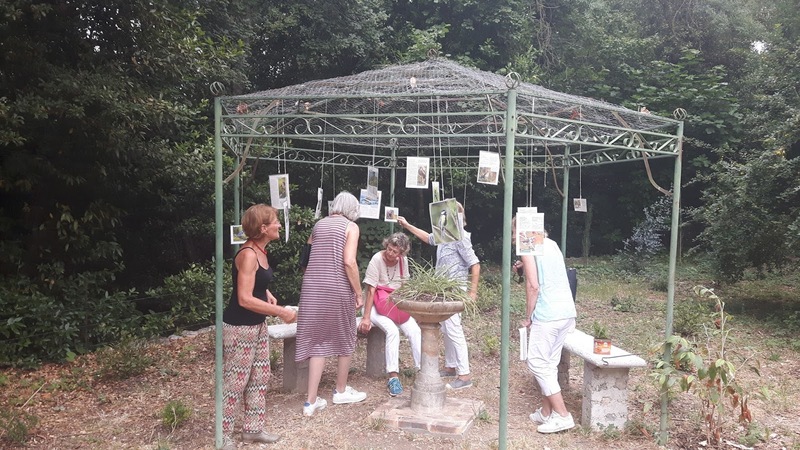 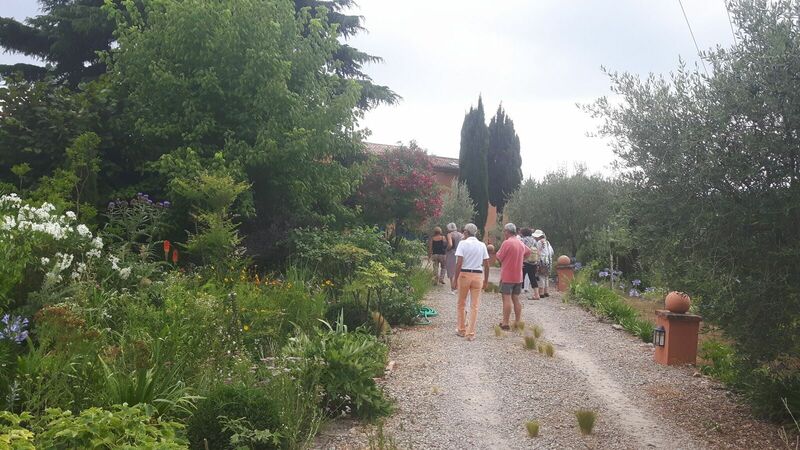 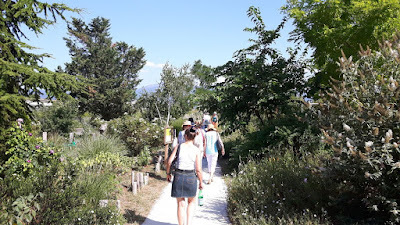 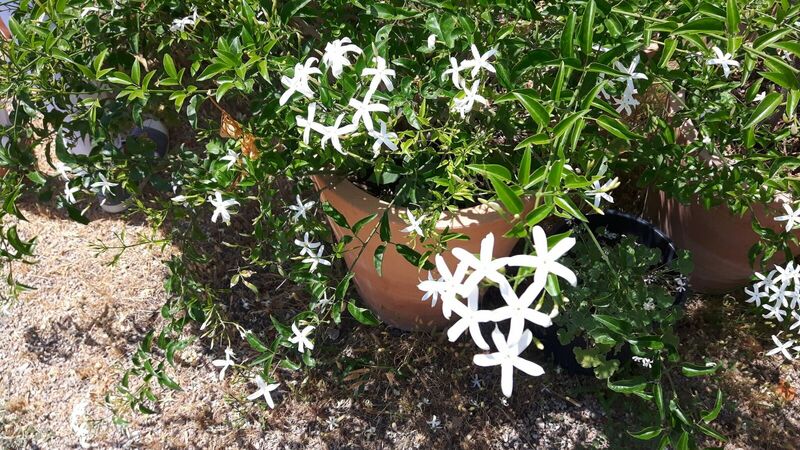 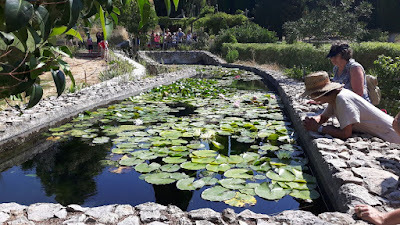 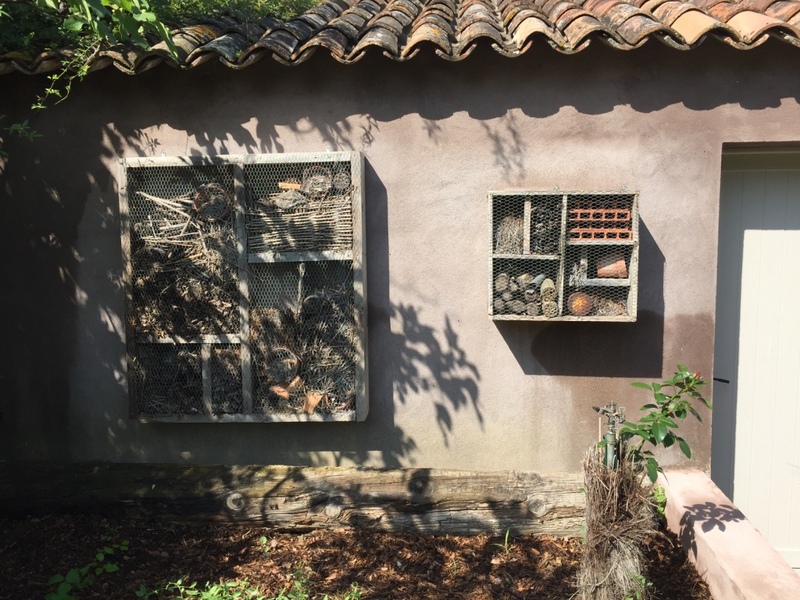 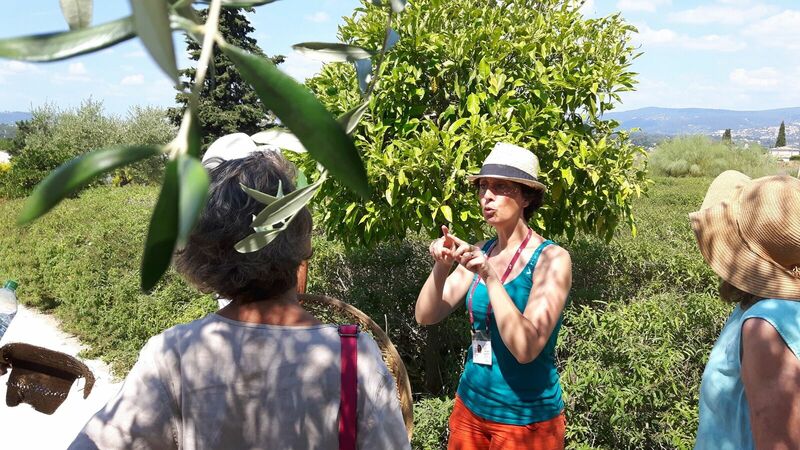 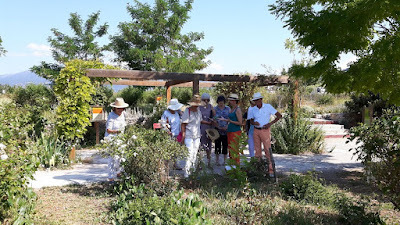 We had a charming bi-lingual guide, Diana, to show us the two hectare garden and were regularly tested on our knowledge of scents when she handed out plastic sticks dipped into perfumed oils – a challenging exercise for the over 70s whose sense of smell is waning! 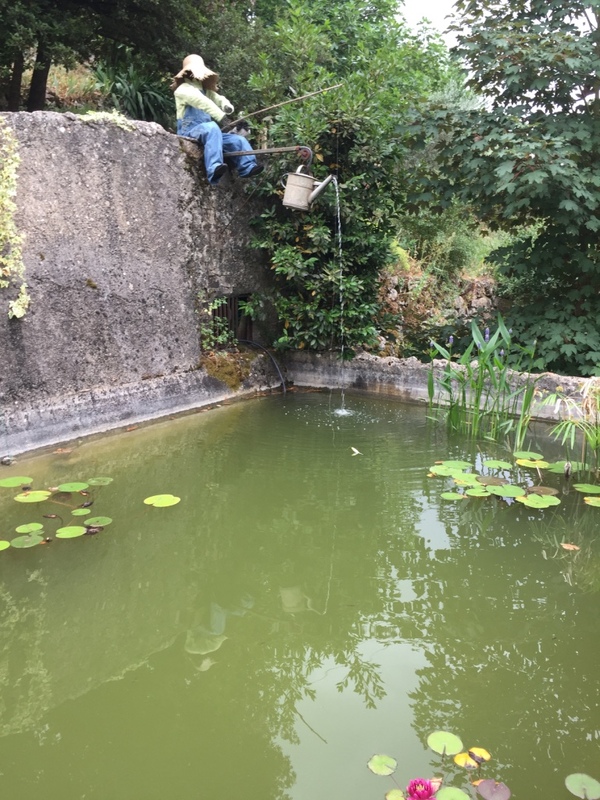 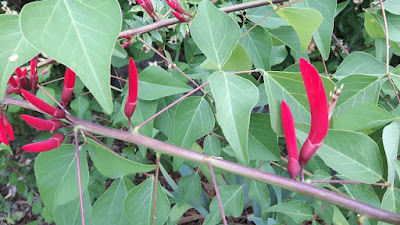 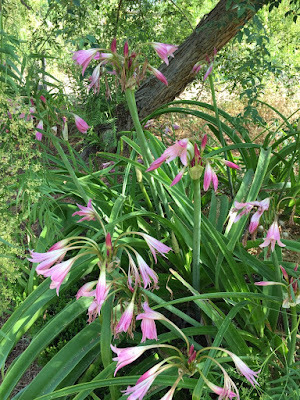 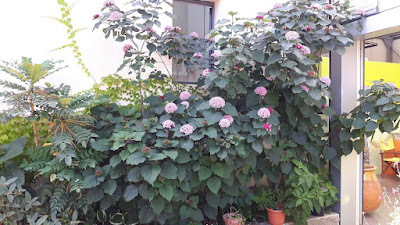 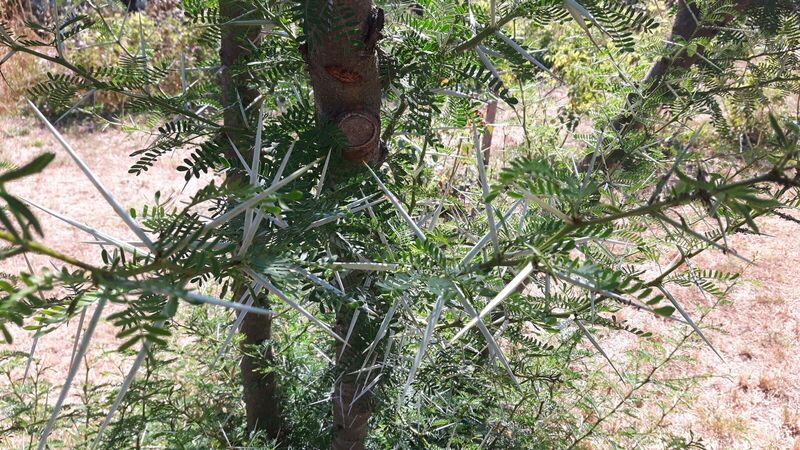 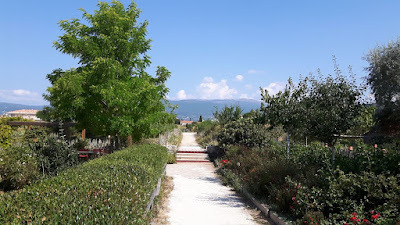 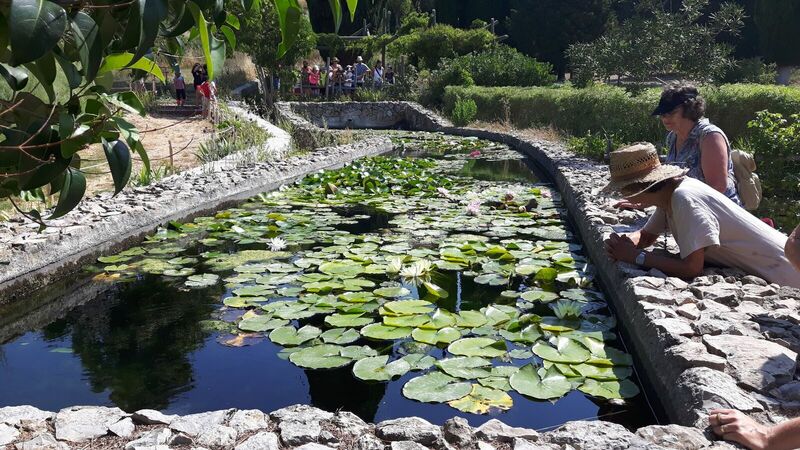 The gardens are entirely bio which, since they are located in a largely built-up area with no agricultural activity, are not affected by any stray pesticides borne by the wind. 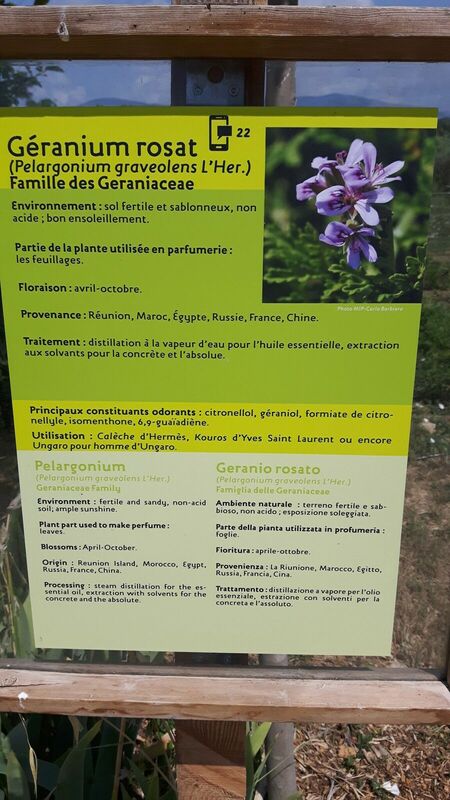 The gardens are all about the perfume industry and act as a reference library and experimental laboratory. 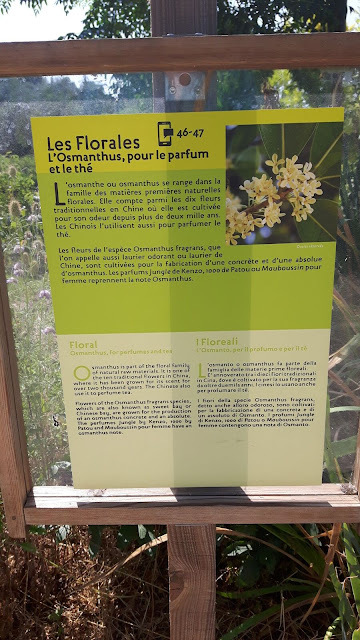 It is astonishing how many petals are required for such a small quantity of the many ingredients which go to make up one bottle of perfume and we now understand and accept why perfume is so expensive. 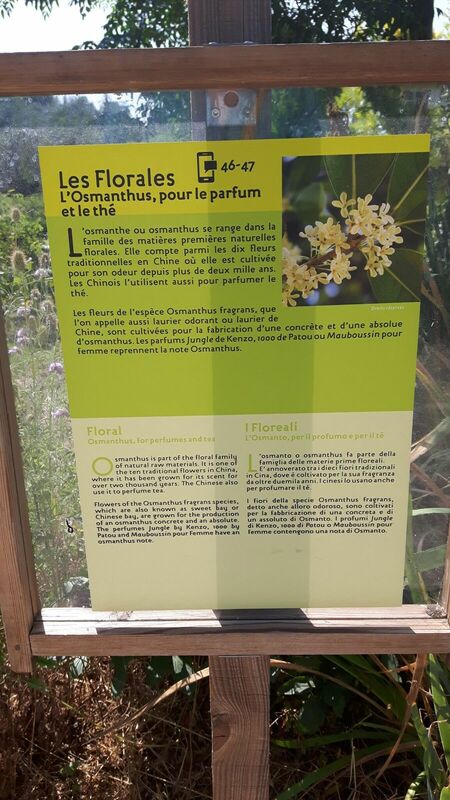 However, another aspect of perfume making was the ultra modern method of analysing the scent from, say, honeysuckle by placing a glass dome over the flower and “reading” the scent. This is then replicated chemically and one wonders whether in the distant future this is how all natural flower scents will be presented to make up your favourite perfume? 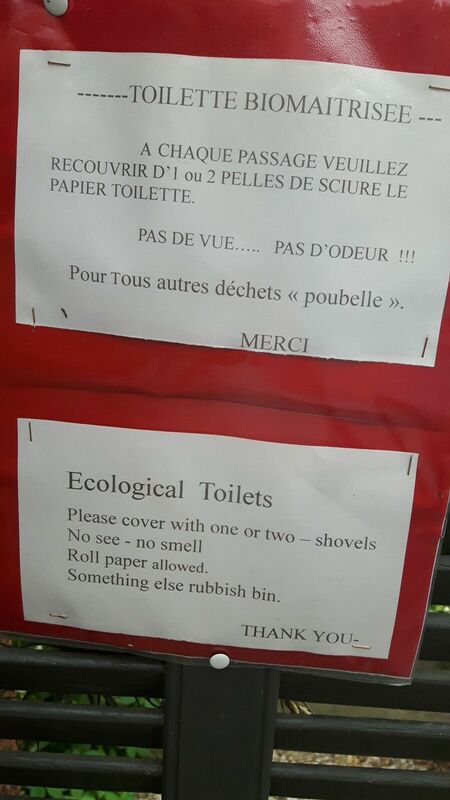 Being far less intensive perhaps its high cost will head in a downwards direction? 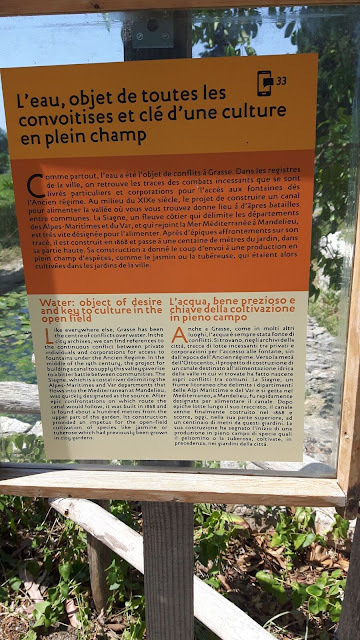 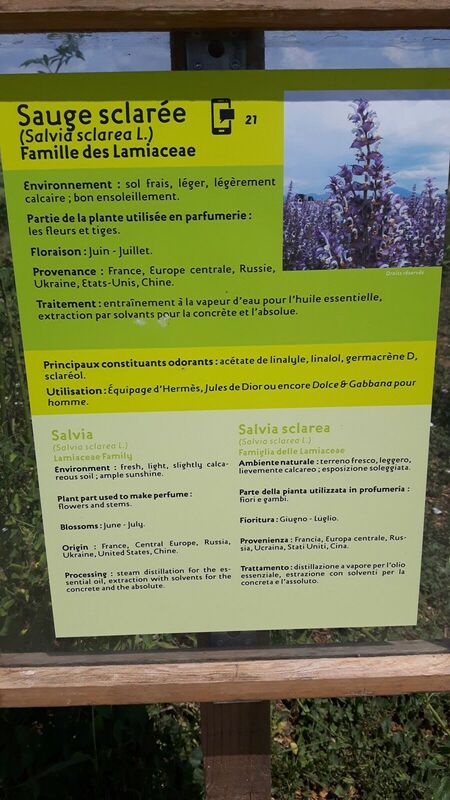 Information on the plants came in 3 languages, French, English and Italian. 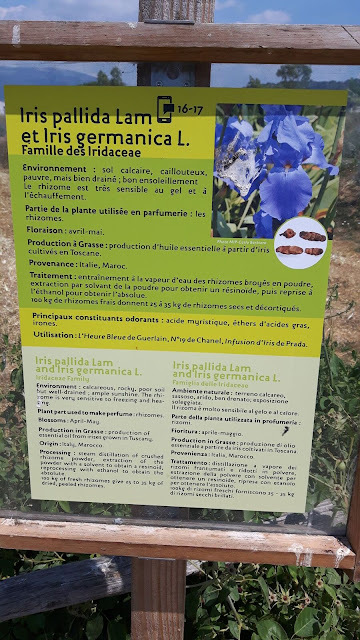 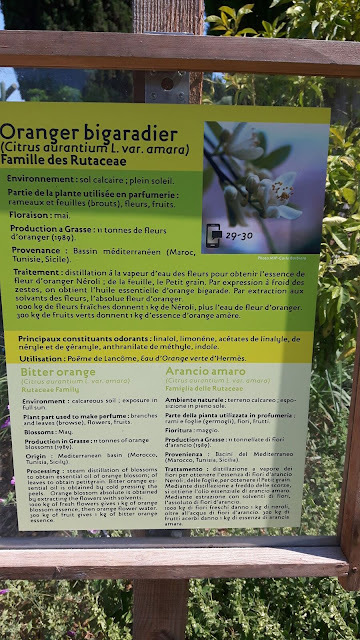 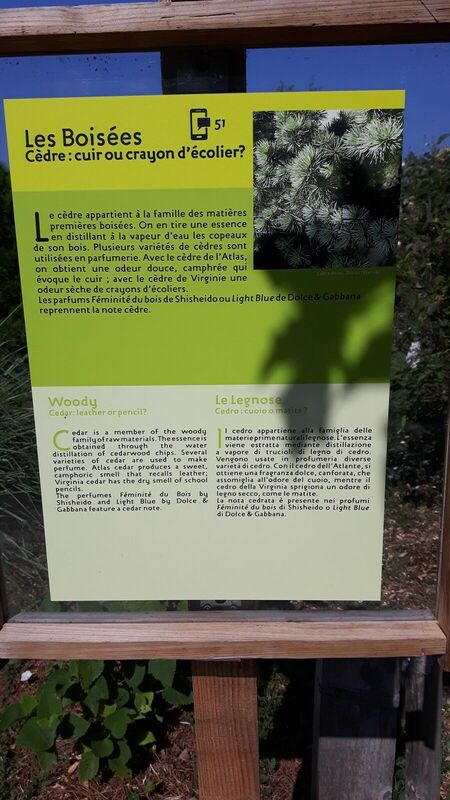 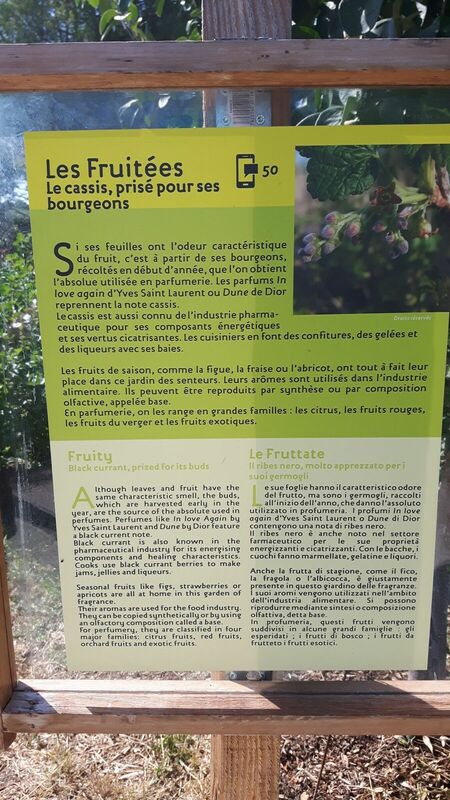 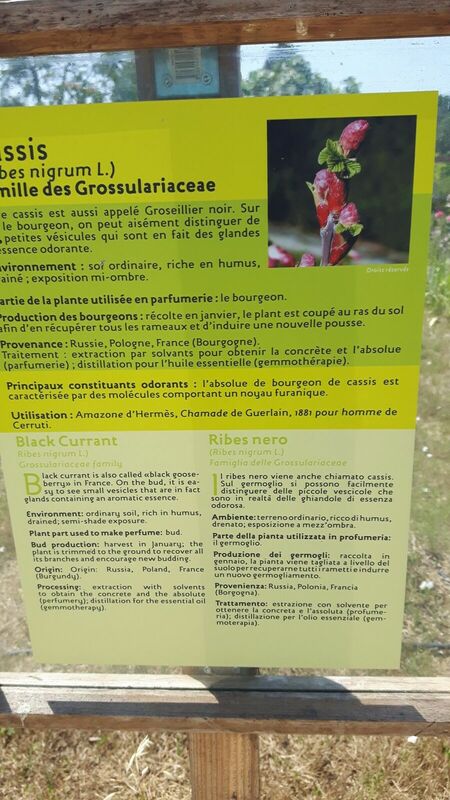 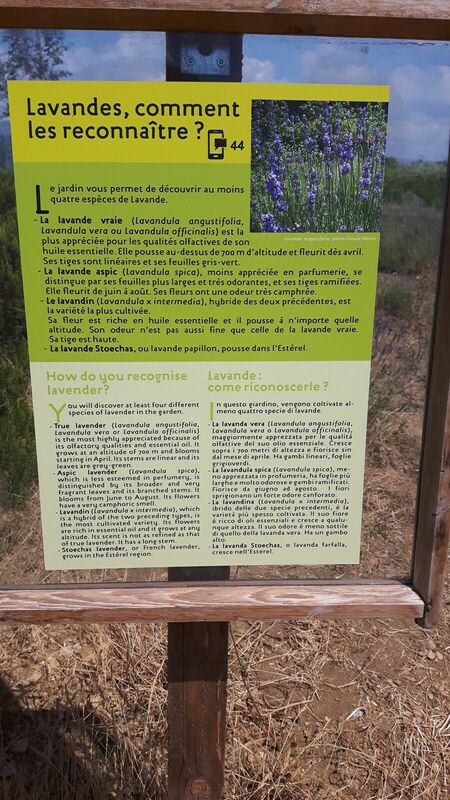 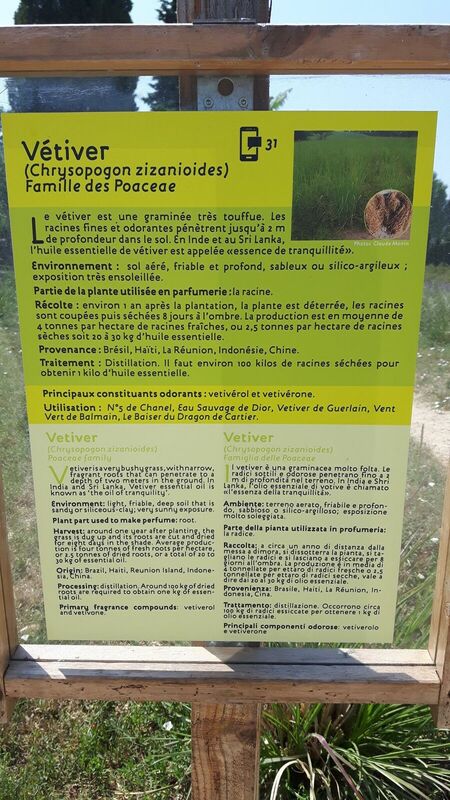 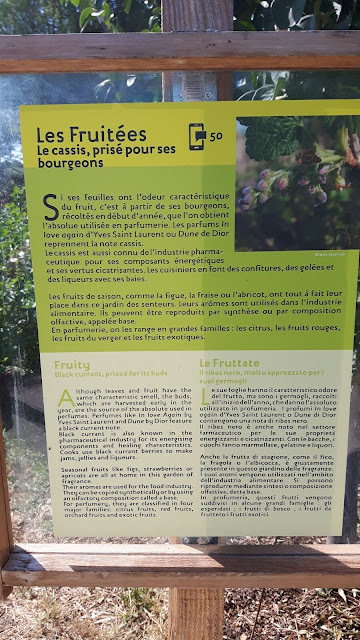 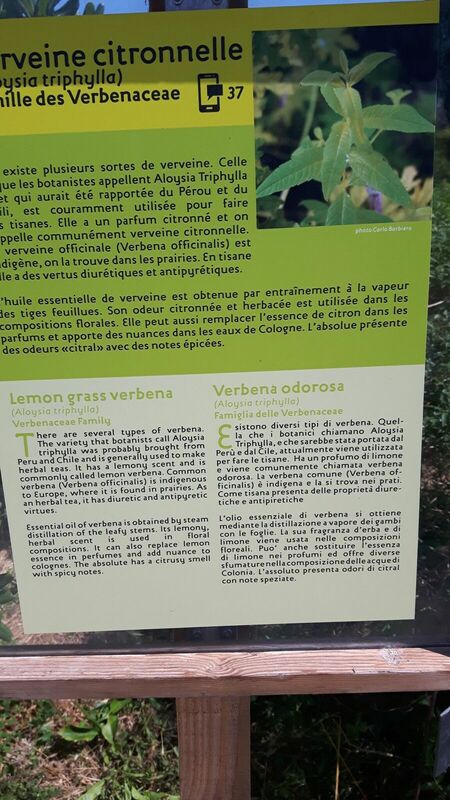 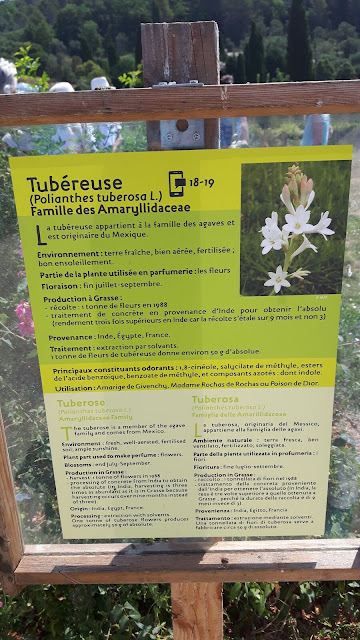 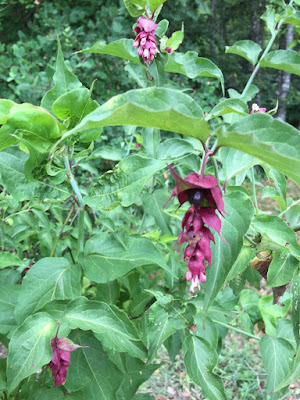 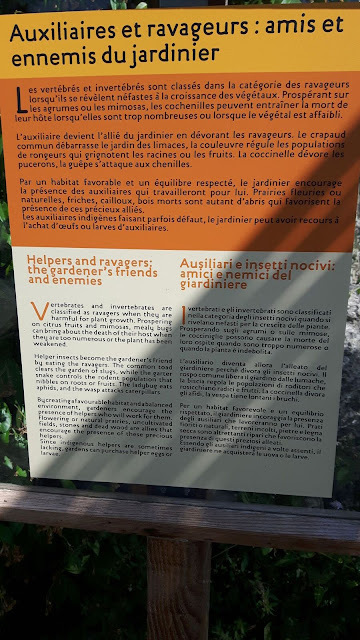 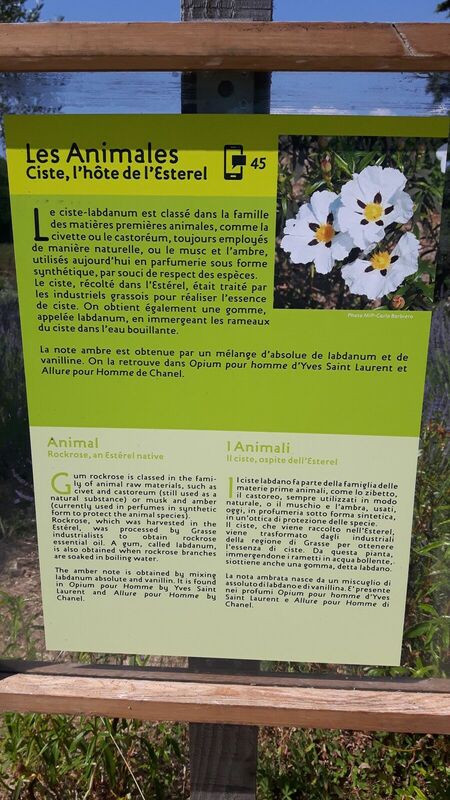 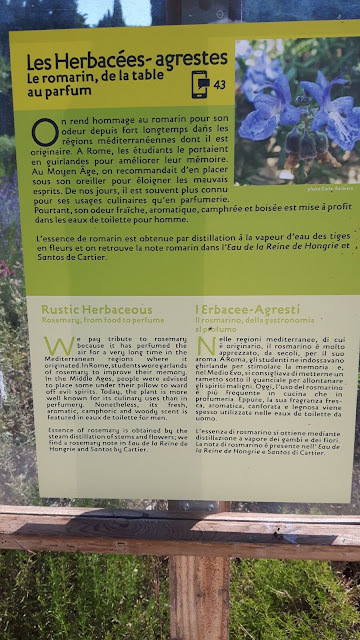 For those who like to know more about the individual parfume plants, the text is a bit hard to read in English, need a magnifying glass, but very interesting. 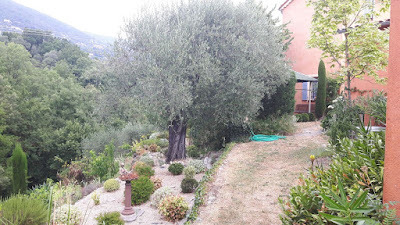 We lunched in Grasse and with great good fortune happened on the closest underground parking to the Place aux Aires where we ate outside in the place under the parasols. 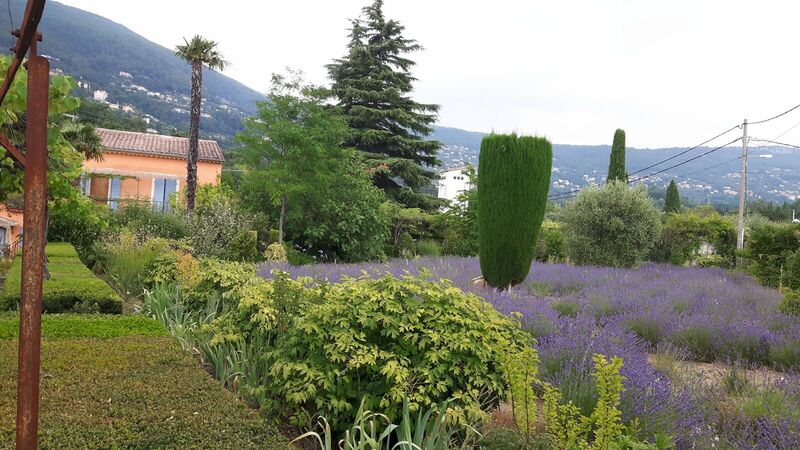 Our second visit was to the Bastide des Pivoines a couple of kilometres from the centre of Grasse. Of course the peonies were over thanks to an early spring and the fact that the first two gardens chosen for this visit had fallen to the wayside (a municipal garden whose website declared it to be open in June but on booking it was closed and an email enquiry as to the precise annual opening dates did not elicit a reply; and the owner of second garden was too busy preparing to let the house to receive us). 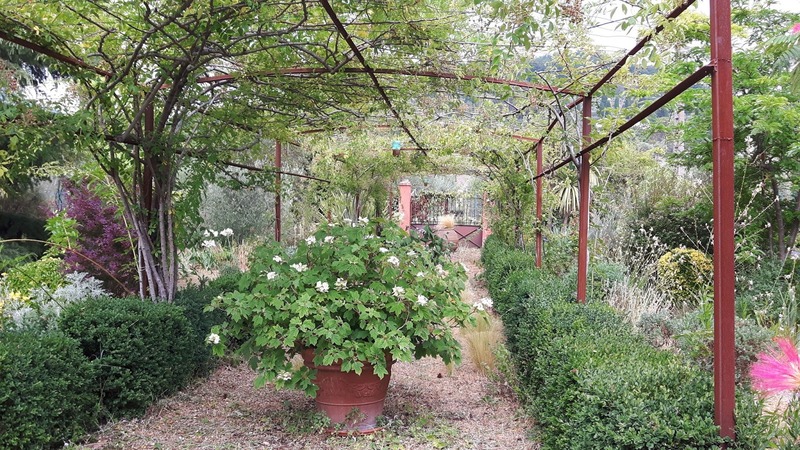 So these two gardens are on the list for 2018. 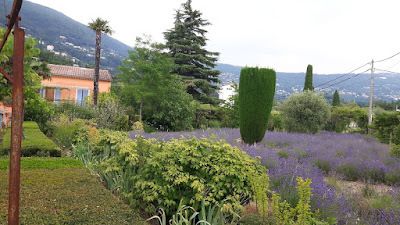 A triangular lavender field is bordered by the peonies after which the house is names and many plants in the garden were brought from their old garden. When I asked about the automatic watering system I was astonished to learn that the 15,000 sq.m. is watered by hand/hosepipe on the grounds that this is the best way to key an eye on all the plants. Two wonderful tall, wide cedars provide a hidden shaded, sheltered area for tables and chairs (so no having to remember to close the parasol when going out in case a mistral winds materialises). 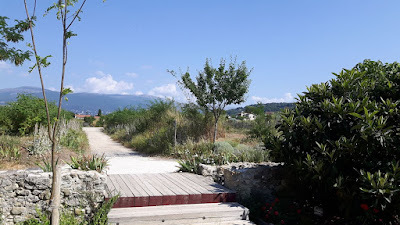 The other half of the garden slopes abruptly down to the river down a stone set path which is so much easier on the knees than steps but must be tricky for wheelbarrowing uphill. 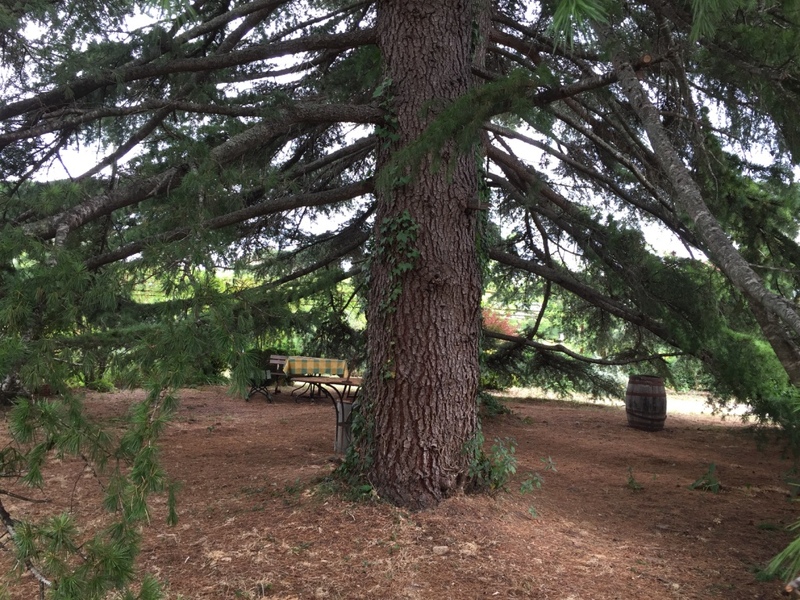 This area has recently been cleared and now contains a carefully chosen selection of specimen trees. A circular gloriette with seating is hung about with laminated pictures of all the birds to be found in the garden, a really useful idea for those with short-term memory loss who will have forgotten the markings by the time they have fired up the computer to identify the bird. 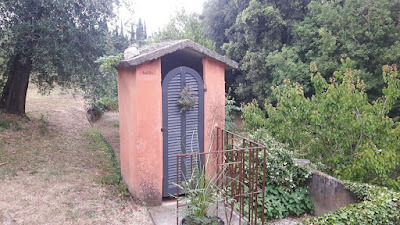 A final intriguing note – the outside privvy is bio so a modern loo seat and lid but over a galvanised container with no water. 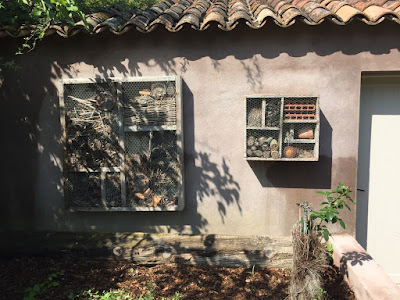 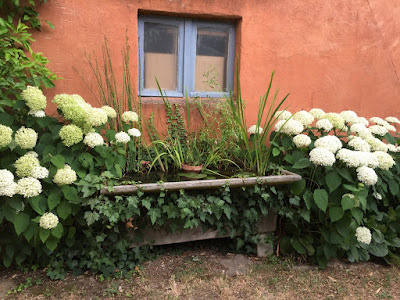 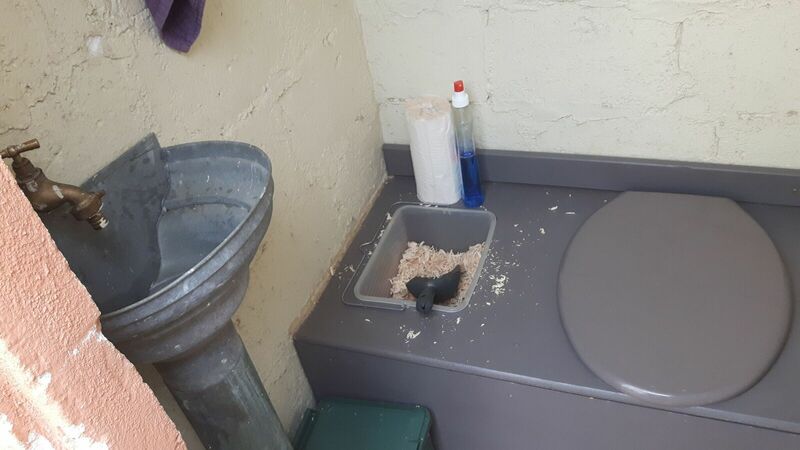 A container with lid and shovel contains wood shavings for adding a fresh layer and a galvanised guttering hopper serves as a basin – wonderful attention to rural detail (see photos).